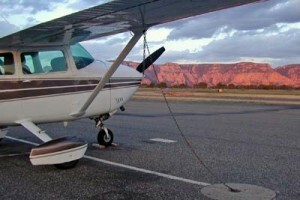 The beautiful red rock vistas of Sedona, Ariz. lure pilots from around the country. Imagine yourself sitting inside the cockpit of a Cessna L-19, a two-seater with a big engine and a climb rate more than double that of a Cessna 172. You’re flying in the Colorado mountains on what appears to be a perfect flying day: calm conditions and severe clear. But with little warning, your Cessna’s flight ends prematurely, going down vertically into gradually rising terrain. The pilot and passenger onboard are fatally injured. But you survive the two-seater’s crash. How is it possible that you could be onboard this two-seater’s flight and survive such a crash in the mountains? This is possible because you would have been watching the final 20 seconds of this flight on videotape from the perspective of someone inside the cockpit. The souls onboard happened to be capturing their flight on videotape by a cockpit-mounted camera when a rather pleasant scenic flight turned tragic in just a matter of moments. Two years after this crash, a hiker accidentally discovered the Cessna’s wreckage. The videotape onboard captured the entire accident. On the tape, the pilot and passenger make sundry comments concerning the beautiful scenery, while the terrain below gradually rises. Moments later, the pilot is aware of the steeper terrain, but by now it’s too late. All of his escape routes are closed. At nearly treetop level, he attempts an escape from the rising earth. You hear the stall warning go off. You see a wing drop. The aircraft enters a stall. And seconds later, it’s all over. It is very chilling to watch this tape. But it’s even more chilling to realize how easily you, as a pilot, can get into such a situation if you haven’t prepared in advance, and how difficult it is to get out once all your escape routes have expired. Certainly the best escape route is to avoid getting your airplane into such a situation to begin with. As a safety-conscious pilot, how do you prepare? There are many good articles and books written on mountain flying techniques, and it would be well worth your time to read a few of these texts to increase your aviation knowledge. But knowledge alone may not be enough to save you. Not one of these books can give you what you really need to fly the mountains: experience. No matter how many hours you may have logged as a pilot, until you experience mountain flying and the related effects of density altitude on a light aircraft’s performance, it’s difficult to appreciate how remarkably different it is compared to the performance your airplane achieves at lower elevations. As a student pilot, you may have learned about the three Hs of density altitude: height, heat and humidity. As altitude (height), temperature (heat), and humidity increase, so does density altitude, or the altitude the airplane thinks it’s at, and performs in accordance with. As density altitude increases, your airplane’s performance decreases. But knowledge about this phenomenon alone is not enough. You may have had an excellent flight instructor during your private pilot training, but if you and your instructor never undertook a training flight north to the mountains of Arizona for a lesson in density altitude to experience decreased aircraft performance, you will want to think twice about flying in the northern half of Arizona, with all its tempting, beautiful mountain scenery. Receiving proper mountain-flying instruction should be your next stop before you take to the mountains. Westwind School of Aeronautics, based at Deer Valley Airport in Phoenix, recently launched a new FAA-sanctioned Arizona Mountain Flying Safety Course. Their one-day course, which is also part of the WINGS pilot proficiency award program, includes 2.5 hours of thorough ground instruction and 3.0 hours of flight training to three of northern Arizona’s most popular, and potentially dangerous, airports: Flagstaff, Sedona and Payson. The ground school, taught by Westwind’s Chief Flight Instructor Jim Pitman, who also helped develop the course, begins with an introduction that describes what mountain flying has to offer pilots: great flying, fantastic scenery, and the tragic consequences of not being prepared for it, as evidenced in the Cessna L-19 video clip. Westwind’s ground instruction covers a lot of material, including density altitude and related aircraft performance, proper mixture leaning procedures for various phases of flight (emphasizing the use of maximum lean for taxi operations), the importance of flying the same indicated airspeed you would normally fly at lower elevations, the effects of weight and balance on a mountain flight, and of course, weather and mountain waves. After the ground instruction is complete and you have prepared your own flight planning, you team up with a Westwind flight instructor, grab a Cessna 172 and head up north to begin your flight experience. Of course, you and your instructor will obtain a detailed pre-flight weather briefing for your entire flight route before launching. Weather can change quickly in the high country and often has much more localized weather phenomena than do the flatlands, so obtaining a thorough and detailed weather briefing is key in making your go/no-go decision. Launching from Deer Valley at an elevation of 1,478′ MSL, you will note your C-172’s familiar 500 fpm climb rate and fly direct to Flagstaff Pulliam, elevation 7,011′ MSL, about a 50-minute flight. As your flight progresses, you and your instructor will discuss each topic gone over in class as it comes up during the flight: route selection, proper methods of crossing ridge lines, determining the effects of wind against terrain, and engine performance. As you will quickly learn during your flight, one of many keys to successful mountain flying is knowing the winds aloft. Knowing how the wind is affected by the mountainous terrain below and visualizing what the wind is doing when it comes in contact with terrain is paramount. To help visualize this a pilot should think of the wind as water flowing over rocks. Flowing water is smooth when running over a flat, even surface. Once the water flows over jagged rocks, it flows like rapids in a raging river where turbulent waves are created, often lasting far downstream. Similarly, as airflow passes over a ridge, mountain waves form, while underneath and often invisible to the pilot are severe rotor waves, which frequently have downdrafts in excess of 1,000 fpm, far exceeding the climb ability of any normally aspirated light aircraft. But how do you determine winds aloft during your flight? Often while flying over the mountains, you may be out of communication range and unable to obtain en route weather briefings from a nearby flight service station or an air traffic control center. If this is the case, then your next best tool is the weather itself. Remember the old standby “see and avoid” for traffic avoidance? In this case, it’s “see and observe.” If there is visible moisture in the air in the form of clouds, then you have another source of information about winds aloft right at your disposal. All you need to do is decipher the message. Every cloud tells a story about its adjacent wind patterns. It’s up to you as the pilot to read what the clouds are telling you about potential winds that may affect your flight. As you make your approach into Flagstaff, Humphrey’s Peak (the highest point in Arizona at 12,633′ MSL) looms nearby, a mere five miles northwest of the Flagstaff runway. If you’re lucky and conditions are just right, you may be treated to a fantastic view of a lenticular cloud resulting from the mountain wave over the peaks, as if the cloud was resting comfortably over the tip of Humphrey’s Peak. Of course, from your ground school instruction you will know that the wind currents running through and below that lenticular cloud will be anything but restful. You will fly a low-pass over the Flagstaff runway to experience what a go-around would feel like at your now-diminished and sluggish climb rate of 100 to 200 fpm, fly the traffic pattern, perform a full-stop taxi back, then launch for Sedona, elevation 4,827′ MSL, about 10 minutes to the southwest. After a brief stop at Sedona to stretch your legs and check in with Prescott Flight Service once more for an updated weather briefing, you will launch for Payson, elevation 5,157′ MSL, where you will perform another full-stop taxi back, and then launch for home. Three hours will have ticked off on the Hobbs meter when you shut down back at Deer Valley, after which you and your instructor will sit down and discuss your flight in detail in your debriefing. There are, however, plenty of other aspects about mountain flying pilots must understand than simply density altitude and weather patterns. Westwind’s course also details other important keys. Many mountain airports have their own visual illusions due to varying circumstances, such as sloping terrain. Nightfall can cause the headlights of cars on nearby highways to appear as a false horizon. Interstate 17, just a few miles off the departure end of runway 21 in Flagstaff, can be a dangerous false horizon if conditions are just right, especially with the fast-rising terrain just beyond the interstate. In addition, each mountain airport has its own unique weather phenomena due to surrounding terrain, as you will learn at Sedona, with its cliffs and jagged rock formations all around the immediate vicinity of the runway. And don’t forget that some mountain airports have obstructions at the end of a runway which may be impossible to clear in a single engine light aircraft, such as the 7,903′ MSL peak just 12 nautical miles southwest of Payson. A thorough pre-flight before launching is key to knowing the complexities of your route over the mountains and the conditions at your destination airport. The videotape of the Cessna L-19 crash that was part of the Westwind ground school depicts many light aircraft mountain accidents, but no flight needs to end tragically like that. It’s up to you as the pilot-in-command to determine the outcome of your mountain flight. Arizona mountain flying offers pilots rewarding flying experiences and fantastic views, but it also raises significant safety challenges that have led to many unfortunate and fatal crashes. Mountain flying and related density altitude topics may be the most consistently under trained and poorly understood operations in general aviation. Jim Pitman and his team at Westwind have put together a thorough course to address the topic, enhance your aviation knowledge, and most importantly, give you the experience you need to safely fly the mountains. You owe it to yourself, your family, and your friends to receive the proper training experience before flying the mountains. For more information on Westwind’s course, visit [http://www.iflywestwind.com/azmfsc.php].